It’s a fundamental principle of developed legal systems that justice is blind. This is often represented by the blindfolded Lady Justice. Objectivity is key to the determination of legal disputes, and parties’ rights and obligations. International commercial arbitration plays an important role in the resolution of cross-border commercial disputes. Rather than submitting their disputes to foreign courts (which may carry significant business risks), commercial parties will often include an arbitration clause in their contracts. Through these clauses, they agree to resolve future disputes by arbitration rather than through State courts, before an arbitral tribunal rather than a judge. The arbitration is likely to be held in a neutral country. Empirical studies carried out at the School of International Arbitration confirm arbitration’s preferred status as a dispute resolution mechanism. What, then, of blind justice in arbitration? Does international commercial arbitration hold fast to this same objectivity ideal? It’s well-established in international commercial arbitration that all arbitrators – even party-appointed arbitrators – must be impartial and independent. However, objectivity can be compromised by means other than bias. An analysis of the current legal framework for resolving the conflict of laws in international commercial arbitration raises serious objectivity concerns, given the wide discretions enjoyed by arbitrators in identifying the governing law for disputed contracts. In most commercial contracts, parties choose their governing law, and these choice of law clauses are generally respected. However, statistics published by the International Chamber of Commerce demonstrate that parties don’t choose the governing law in around 16% of cases, based on the ICC’s 1990-2015 case load. 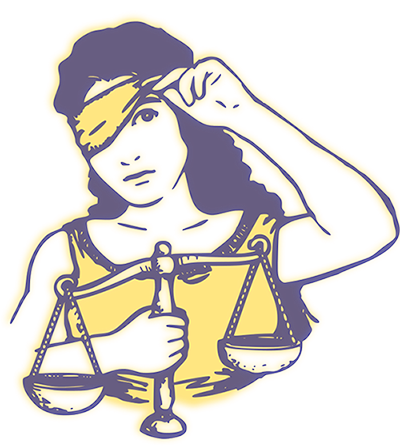 Lady Justice, Not So Blindfolded, by Karolus_BR. Public domain via Wikimedia Commons. Though it’s a distinctly commercial form of justice, international commercial arbitration remains a dispute resolution process grounded in the application of law. Where parties do not themselves choose a governing law, and where a dispute arises under their contract, its identification falls to the arbitrators. Different legal systems provide different solutions to different legal problems. The following are just a few examples where the law may differ from State to State: whether or not commercial parties owe good faith obligations; the availability of specific performance as a contractual remedy; the enforceability of agreed sums for breach; and the length of time permitted to bring proceedings under relevant statutes of limitations. When making choices between (different) potentially applicable laws, arbitrators exercise a conflict of laws function, which stands to substantially affect the outcomes of cases. Take, for example, arbitral proceedings that are instituted after three years; where the Respondent’s State has a two year statute of limitations; and where the Claimant’s State has a four year limitation period. If the Claimant’s home law is applied, it will at least be afforded the opportunity to argue its case, but if the Respondent’s law is applied, the claim will not be allowed to proceed at all. Given that arbitrators’ conflict of laws determinations can substantially affect the outcomes of cases, it might be surprising to know that there is often no specific test or rule for arbitrators to apply in choosing between different potentially applicable laws. Rather, arbitrators are generally empowered to apply the law deemed “appropriate” or “applicable.” The matter is otherwise left entirely within their broad discretion, to select whatever law is felt (by them) best suited to the dispute. None of these rules – or the world’s many others like them – provide sufficiently certain tests or criteria for arbitrators to apply in making conflict of laws decisions. The discretions enjoyed under these kinds of provision are so wide, that arbitrators may ground their conflict of laws decisions in any reasoning – even their subjective assessments of the merits of competing laws. How does this comport with the ideals of objective justice? Arguably, this kind of discretionary procedure does not sit comfortably with objective dispute resolution, and thus the needs of arbitration’s users. User needs are an important consideration in the design of arbitral procedure – arbitration’s very existence, as a legal institution, is premised on serving international merchant needs. From the parties’ perspective, arbitrators’ wide conflict of laws discretions lead to legal uncertainty, and generate transaction costs. Not only do the parties’ rights and obligations in an arbitration itself stand to be affected, but also their contractual performance before any dispute even arises, and their settlement negotiations. Uncertainty over the governing law can also impact upon the parties’ due process rights in formal arbitral proceedings. Arbitral procedure is in a constant state of reform. States and arbitral institutions strive to innovate, and to improve their arbitral laws and rules, based on their assessment of user needs. Recent reforms have included provisions addressing complex arbitration issues such as consolidation, as in Art. 22(1)(ix)-(x) of the LCIA Arbitration Rules 2014, and also provisions regulating the early dismissal of claims and defences where “manifestly without legal merit”, as in Art. 29 of the SIAC Arbitration Rules 2016. Is arbitral justice blind? On the current state of the law, not quite. Curtailing these wide conflict of laws discretions currently prevailing in arbitration – and replacing them with a more certain rule that would be more useful to arbitrating parties and their advisers – would be a worthy item for future attention in discussions about the ongoing reform of arbitral procedure. Featured image credit: Statue Of ‘Justice’ Old Bailey by Lonpicman. CC BY-SA 3.0 via Wikimedia Commons. 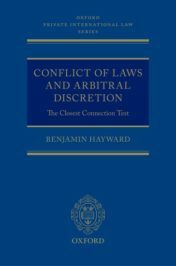 Dr Benjamin Hayward is a Lecturer in the Deakin Law School at Deakin University, Australia, and is the author of Conflict of Laws and Arbitral Discretion – The Closest Connection Test (Oxford University Press, 2017). Dr. Hayward’s teaching and research span a range of commercial law and international commercial law topics, with a particular focus on private international law, international commercial arbitration, and the international sale of goods. You can follow Dr. Hayward on LinkedIn, Twitter, and find his work on the Deakin Research On-Line institutional research repository.